You cannot win two ko fights at the same time. Your opponent can choose capture in the ko as a ko threat. Moreover, you can do the same thing. One of the kos must be given up. Choose wisely. When the ko is won and you connect a dango is formed. Or ponnuki. There is a great difference between these two situations. Charles True, but it seems that is wasted here. 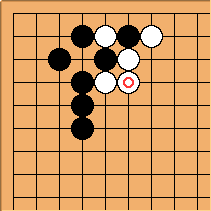 Local tally and efficiency of shape are probably more important than thinking about dango shape, in these cases of ko. When you win a ko because your opponent has run out of ko-threats, you may boldly start another one. Your opponent cannot find new threats easily. Charles Yes, it's a good point, and sometimes this strategy is seen in pro games. If one player has many more large threats, say Black has five more, winning a ko will still leaves Black four more large threats and (depending on whether the ko result is thick or not) White may have gained none. Increasing the value of ko is considered a dangerous thing. Charles I called this issue 'Addition Tally Principle' in my articles on Gobase. It's not a simple matter, but in general you could say that increasing the value of the ko is only correct for the player who will win it. Bill: One of those complications Charles alludes to is the ko exchange. Upping the ante is OK, even if you lose the ko, if you get enough in exchange for it. Such situations are not all that uncommon. Charles Actually, just saying 'increasing' could mean several things. 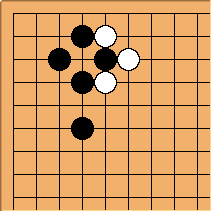 In some cases a player ignores a ko threat to play another move near the ko, which makes finishing the ko more attractive for one side (like in the example at the top of the page). What is at risk in that case is that if the ko goes the other way, that play will be a wasted move, a bad trade for the ignored ko threat. And on the other hand some common local ko threats just make the number of points involved larger, without changing what I call the local tally. Playing a doomed or failed ladder as a ko-threat is a dangerous thing. Charles It is a proverb that 'adding one stone in a ladder can cost seven points'. While fighting the last ko of the game, the smallest threat is to form another ko. An exchange of the current ko for another one allows to save the ko-threats.